A Catalan by birth, Joan Mirò (1893-1984) moved to Paris in 1919, and was introduced by André Masson to the Surrealists, André Breton welcoming him as a kindred spirit. In 1924 he found his own style: a world of violent colour, shapes and symbols, vaguely alarming insects, but full of the light and innocence of childhood. All his work provokes the same basic question: do these worms turning in the womb indicate dark oedipal fantasies, or just joyful exuberance in the face of grey everyday reality? 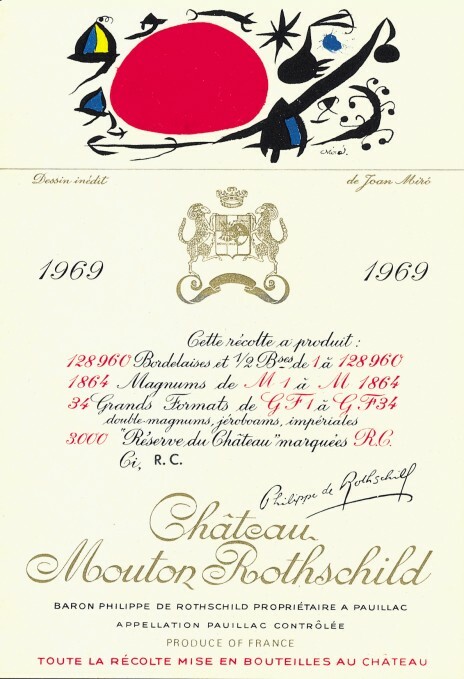 Dominated by a vast, blood-red grape, his label for the Mouton Rothschild 1969 includes a discreet but witty obeisance to the family: the blue and yellow of the Rothschild racing colours.